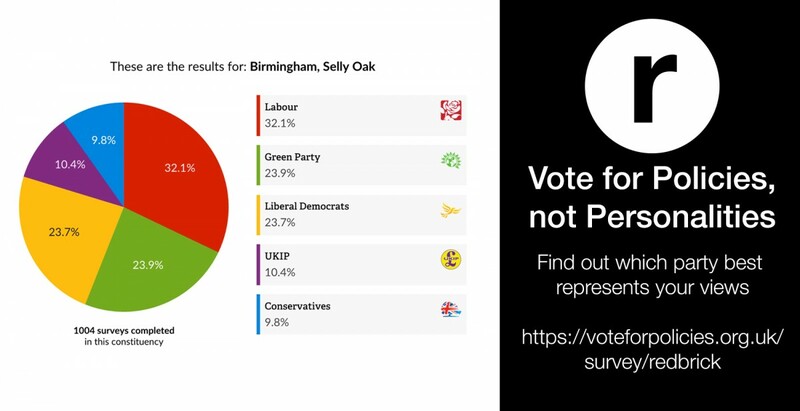 The Green Party retain their lead in this week’s Redbrick poll as their support equals that of last week on 35%. However, a reduction in the proportion of the support for the Conservative and Labour parties causes this to become an 11% lead. Both the Conservative Party and the Labour Party scored 24% of the vote, with the Conservative Party reaching their lowest proportion of the vote since the poll started. Meanwhile, the Liberal Democrats and UKIP saw extra votes this week. The Lib Dems saw an 8% increase from 2% to 10%, while UKIP jumped from 0% to 5%. Students registering their interest in voting for a different party also remained the same as last week, at 2%. Positively, students saying they don’t know who to vote for or won’t vote remains static at 0%. A total of 62 students participated in this week’s Redbrick poll, seeing an increase of 10 from last week. We’d really encourage you to take part in the poll when it opens on Monday, even if it is just a little bit of fun! If you’ve got an idea about who you plan on voting for, or even if you don’t, make sure you vote for that choice between 00:00 on Monday and 23:59 on Friday! Coming up this week is the final of the national General Election debates – a special Question Time on BBC 1 on Thursday at 8pm. Additionally, there are a number of General Election events taking place on campus with, in particular, Sky News coming to talk to students about their current opinions on politics and parties. The latest issue of Redbrick includes a double-page feature covering the General Election; make sure to check it out. Our next issue, out the Friday (May 1st) before polling day (May 7th), will also include a special feature, including the results of our Vote for Polices survey.